Founded in 1893 in Evansville, Indiana, a small unknown mattress company joins the Southerland family. In 1893 music didn't stream in over the internet, you didn't need electricity to read books, food was never grabbed out of a machine- but one thing was the same- folks slept on very comfortable beds thanks to Southerland. Our families have made and slept on our beds for over 119 years and we want you to, as well. It's our dedication to making it right that lets us sleep with a smile, and wake up with a sense of purpose. While the business of high quality sleep changed a lot over all these years - the technology is shinier, the marketing is digital, the mattresses are better - Everything we at Southerland do still starts the same way, by putting you first. Building strong communities, forging enduring relationships and creating jobs all across the United States have been some of our proudest achievements. Southerland takes to heart the happiness and satisfaction of its employees and its customers- it's the only way we know how to do business. So wherever you decide to rest your head tonight, rest easy knowing Southerland has been making it right for a long, long time, and we're going to do the same thing tomorrow and the next day and the day after that. This is our heritage and we are making it one mattress at a time. Southerland is a company founded and operated in America, with a commitment to serving the world great sleep products. 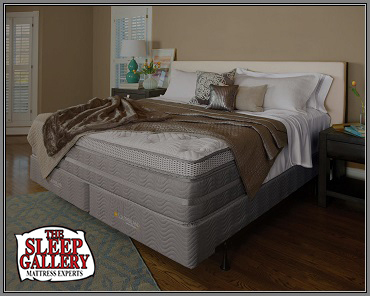 As you shop for a new mattress, The Sleep Gallery would like to invite you to our professional mattress showroom located in Tallahassee, Florida. As the area's mattress experts, we display dozens of the finest sleep systems in America, which includes Southerland Bedding products. We encourage you stop by and explore, pressure-free, and allow us to explain the many features, construction methods and materials incorporated into every Southerland mattress. Our company was founded over 100 years ago by people who cared about people - not profit, industry or competition - just the folks around them who mattered most. Our Southerland line of mattresses is the essence of what we do - quality products for quality people. Luxurious Stretch Knit Covers - Our luxurious stretch knit covers allow the comfort and conformability of the quilt layers to provide maximum support and pressure relief. Supersoft Foams - These are used in the surface of our bedding to create a much more durable mattress than those made from fiber-based products. All QUILT foams are treated for a healthier home environment and are manufactured without ozone-depleting CFCs. Premium Comfort Layers - These are used over the support system to maximize pressure relief, durability and comfort. We use specially engineered foams to custom tailor our beds to offer the greatest range of comfort choices. Gel-Infused Memory Foam - These adjust to the contours of your body while offering superior comfort. Gel also adds a combination of cooling & support factors for a durable and cool sleeping experience. Talalay Latex - This delivers relief to your body, dispersing pressure and eliminating pressure points that inhibit circulation and prevent tossing and turning. Foam Encasement System - Our Foam Encasement System locks in the innerspring unit and forms a durable seating edge that increases your sleep surface by 10-20%. Alternating Coil Technology - Provides improved perimeter consistency so you can assure you rest comfortably…anywhere – even on the edge of their new mattress. 21% more coils – Has a higher count than the industry standard, which means more support for your customer’s body and that’s more news you can use! You get more surface coverage – That means more body support and a better night’s sleep compared to industry standard units. Individually Wrapped Coils - They target zones of your body dispersing pressure and eliminating pressure points that inhibit circulation and cause tossing and turning. Also designed to give the correct amount of support to the shoulder, hip, thigh, and calf areas. Zoned LFK Innersprings - This targets specific zones of your body, eliminating pressure points that inhibit circulation and cause tossing and turning. Since our bodies are not uniform, our 3 ergonomically balanced zones of support are designed to give the correct amount of support to the shoulder, hip, and thigh and calf areas. House Foundation - The Southerland House foundation provides enhanced stability and support, increased support in the center of the bed, where support is key. 100% kiln-dried wood make up 21 solid wood support blocks with mitered blocks of solid wood at each corner for durability. Ultra Flex Foundation - Our Ultra Flex Foundation offers the best support for you to sleep on. It flexes independently for more sensitivity to mattress support, and more durability with less friction.